I had a tough time picking out a pair of shoes. I don’t actually have that many pairs to choose from – maybe 10? And honestly, I wear the same pair of shoes (Keens) for about nine months, and the same pair of boots (Raichles) for the the other 3 months. If you dig around, I have a somewhat out of date travel web site*, and I have this lovely crappy photo of a pair of Timberland boots that I wore around the world, and down to the nails (sitting atop a kilim I bought in Morocco and shipped home on a donkey, but that’s another story), and I suppose it says a lot about how I think of shoes. For one, I prefer to buy the best made shoes I can more or less afford, and wear them and repair them until they utterly give out. But. But … these shoes. Now these shoes, they look practically new. But they were purchased in Seattle, on a 3 month West Coast junket, completely on impulse after I saw them in the window, in the summer of 1994. I was contemplating living on the west coast, and spending time in different towns, and this particular store just drew me in. I remember Whipsmart (Liz Phair) had just come out and they were playing it, and after every song, I asked, “and who is this song by?” like an idiot, and they kept telling me Liz Phair, from Chicago. I suppose I should have mentioned I’m from Chicago. Then they played the Palace Brothers, of course I had to ask, and yes, they’re from Chicago too. So right off, these shoes from oh so far away pointed me back in the direction I’d just come from. Since then, they have been to many weddings, and even officiated at one! They have criss-crossed the United States, been shipped to Europe, seen some amazing concerts, been to several burns, have attended Theater Bizarre, have ridden at least one fire-breathing dragon, and no doubt been privy to things better left unsaid. My secret is, I practically never wear them. Sometimes only for 15 minutes. They might go dormant for months, or even a year. I love them because every now and then, they are, absolutely, the perfect shoes. I feel the same way about all my favorite things – the more I like it, the less I use it. I like to savor my favorite things, when they offer that rare experience. The more amazing I think a movie is, the longer I wait to see it again. I try to never wear my favorite most irreplaceable T-shirts. I do wear them of course, just… sparingly. It’s probably in part because I make things. Wood, metal, digital, practical, and artistic, tangible, and completely ephemeral, I’ve made oh oh oh so many things. When you make things, you realize they have a lifespan. They have a purpose. They have a finite number of uses, and then they are gone. There are few things that we make that will long outlive us, certainly that’s true for many of the things I make. In fact, as a regular participant in Burning Man and some of its many regionals, there are things I make that have no purpose other than to be immediately burned. And that is a beautiful, and a powerful thing. At the other end of things, I also make acoustic classical guitars (one of which I finish every few years), and I certainly hope they will last lifetimes, and better still, that they will make amazing and beautiful music every time they are used. They are the one thing that I know will be most cherished, in no small part because you can see and feel how much work and love went into them. Oddly (? 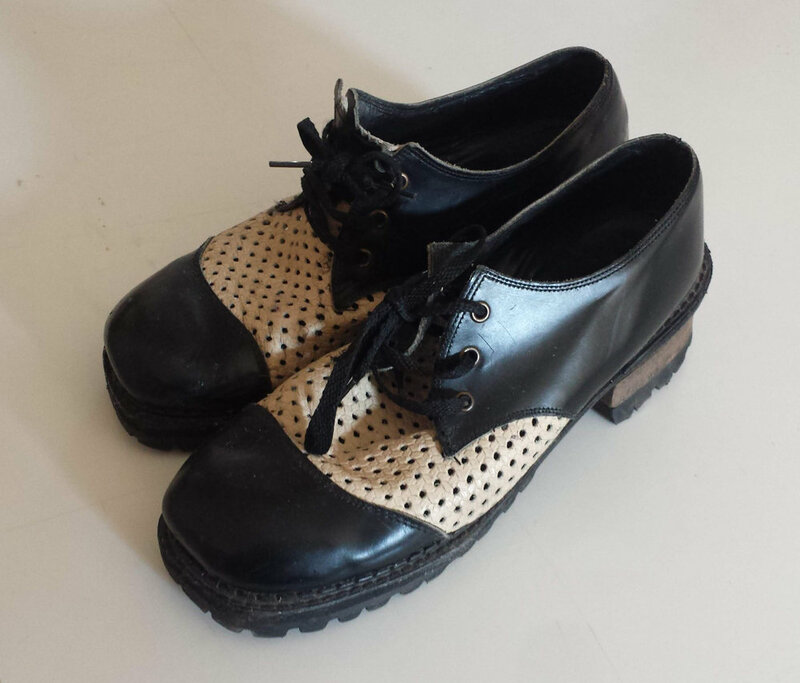 ), it’s like that with these oh-so-perfect shoes: they were made, and re-made by hand. They are not just shoes, they are the shoes – for the right moment. They make the moment, by making me feel so oh-just-right. There is a special pleasure in hand made things, and this is certainly a constant in my life – that so much of what surrounds me was made by hand, by mine, or someone I know, or at least that I know that it was so. It changes how we feel about the things around us when we know that they were made by another. My shoes remind me of all these things. These are my shoes.